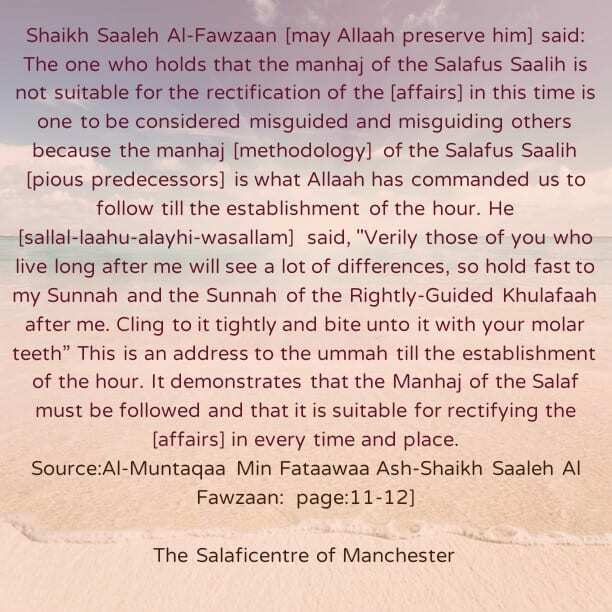 Question to Shaikh Saaleh Al-Fawzaan [may Allaah preserve him]: ”Some of the people claim that the manhaj of Ahlus Sunnah Wal Jamaa’ah is not suitable for this time, and they sight (as proof for their argument) that the precise regulations of the Sharee’ah held by Ahlus Sunnah cannot be actualized in this present era. The one who wishes to isolate the ummah from the Salafus Saalih is one who wishes evil for the Muslims. He is one who wishes to change Islaam and he is one who wishes to initiate innovations and Mukhaalafaat (things that are in opposition to the pure Religion). It is obligatory to reject this one, cut off his argument and warn against his evil because the Manhaj of the Salaf must be followed and the Salaf must be taken as examples. The Manhaj of the Salaf must be followed and that is what is in the Book of Allaah and in the Sunnah of His Messenger as we have mentioned. The one who wishes to cut off the Khalaf of the Ummah from its Salaf is one who works corruption in the earth. It is obligatory to reject, refute his statement and warn against him. The shee’ah and those in agreement with them are the ones known for uttering such statements, so they are not be to be given any consideration.